I got this used car last week. Drove for the first time at night today. I felt the headlights are not bright enough. After reaching home I tested multiple combinations - and found that there are three lights on each side (excluding the fog lamp) - the outermost is tiny yellowish light (#1 in the pic). The one next to it is a bit bigger and turns on automatically (#2 in the pic). The largest one is next to the front grill (#3 in pic). I found that the larger light (#3) turns on only when I switch to high beam. Does it seem faulty? Also, is it possible to put LED lights here? Can't speak to your vehicle, but headlights work fine on mine. No idea which elements are used for DRL / low beam / high beam, but they are effective at night, at least as much as any other car I've owned. There are two different headlight options, both of which look very similar. The first one pictured here is of the LED equipped one. The two outer most lights are very similar in appearance and both function on the low beam setting. 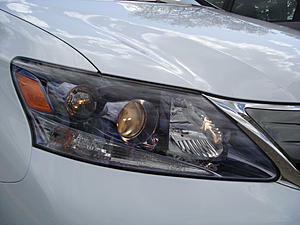 The second pic shows the halogen equipped headlight (which is standard). With the halogen headlight, the middle lens is the low beam light and the outer one is a diffuser of some sort and doesn't contribute to the light output (from what I see). The easiest way to tell which your car is equipped with is to look at the outermost lens. If it is rubbed (like in the second pic) then you have the halogen option. The reflector in the corner (closest to the grill) is indeed the high beam light. If you want a brighter light you can opt for an LED bulb in the low beam. The bulb type is H11. I'd note though that installing LEDs May cause some glare. Last edited by yardie876; 01-09-18 at 08:38 PM. www.xenondepot.com is a good source for upgraded bulbs, both LED or HID. I went with the much cheaper H11 to H9 bulb modification as the H9 bulb fits in the socket with use of the Bulb Zilla harness adaptor (about $30) and a minor tab cutting. The bulbs themselves are 3 times brighter, but burn out every year. This is a popular modification and is covered in many Prius, Mazda and Subaru forums. The H9 bulbs are really cheap on Amazon. 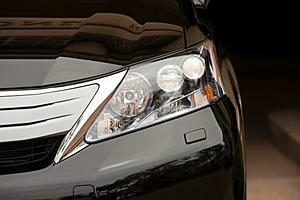 We have a 2010 Lexus HS250H Lighting Guide that can help you get started looking at options. If you have stock halogen lighting, you would need H11 bulbs for your Low Beams and 9005 bulbs for your High Beam/DRL combination. If you go with an LED upgrade on either of those, you would only need the CANBUS/PWM anti-flicker module option for the High Beams, but be aware that the LEDs are not going to be able to dim and provide a lower level of brightness in DRL mode. They are basically On or Off, with no in betweens. If you have headlight washers, then you have the factory LED headlight option as this was the only way to get headlight washers. If you say that light #1 seems dim and yellow, then you might have a problem with the head light system and only the dealer can repair it. The factory LED headlights are not user serviceable. 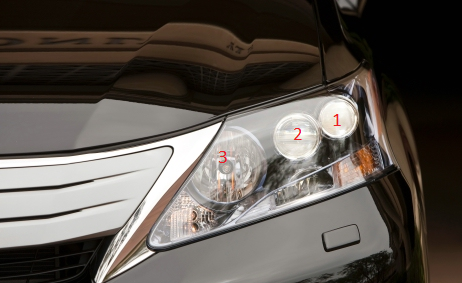 Only the high beam (#3) bulb can be serviced or replaced. If this is the case, then it might cost you thousands of dollars as the headlights are only available from Japan at about $1800 per side. Those two lights (#1 and #2) should be super bright and very white in color at almost a 5000K color temperature. The driving light near #3 should be dim and yellow. Also the small triangle light above the washer and next to the turn signal should be bright also. Your lights should also articulate and follow the corners as you turn the steering wheel. My factory LED headlights on my HS where the best headlights I ever had on any car I've had yet, and I've had 25 cars. Your might have a problem if you think they are dim. The LED's will never work. The connections are not the same, plus your car doesn't have the computer installed to control them. Good luck. Replaced my low beams (with Aliens H8/H9/H11 LED Xenon Headlight Conversion Kit CANBUS 6000K w/ Copper Braid) have used since September 2017 without issues. Has anyone tried upgrading HID for the low beams? I’m thinking of getting a pair but I’m afraid it would melt the housing.. any idea? Yes, we've had a few customers and forum members install the H11 Xtreme HID kit in the Lexus HS250h without any issues as our Xtreme HID kit uses a 35w low starting draw ballast which is going to be more efficient than your 55w halogen bulbs. Additionally, all of our HID bulbs use Philips UV quartz glass to ensure the bulbs to not damage your headlights. Let me know if you have any other questions about your upgrade options. I've both Low and Hi beams converted to 55W HIDs for several years and its working fine. I've tried several LEDs - many of them claimed light intensity (in lumens) which were several times higher than HID - unfortunately none of them worked! Even though their lumens may have been higher, they didn't look as bright at HIDs. The only thing I can think of is that in both incandescent and HID, the light source is very small (and very bright). Whereas, in LEDs, the light source (LEDs) are spread out which results into the beam going haywire. * Higher the K (e.g. 5000K) the bluer the light - but bluer light is "not" as bright for driving. Stick to 4300K. * HIDs come with ballasts and related harness. The harness can be problematic sometimes - pay attention and buy the right kit. * HIDs don't last as long as incandescent - always have a spare pair in the trunk. * Park your car in front of your garage with garage door down, change one side at a time and check to ensure that the beam is more or less in line with the other side (with stock bulb). The Low beams are encased in lens and I wasn't too worried about them. Hi beam is not - but installing HIDs in Hi also worked fine with same beam pattern as stock bulb. * Installing HIDs on Hi beam results into NO DRL and "Flickering Problem"
Last edited by rajeev6; 12-31-18 at 07:45 AM. I have LED on mine works super well.